Meet Jay Baer, the most well-known advertising and media expert and speaker in the marketing industry today. His blog, Convince & Convert, was ranked No. 1 in marketing blogs around the world and No. 3 in social media blogs by the Social Media Examiner. He has consulted with 29 of the Fortune 500 and has started five businesses. He co-authored the book The Now Revolution: 7 Shifts to Make Your Business Faster, Smarter and More Social. In it, he discusses the need for businesses to evolve with technologies and popular social media. Baer is not a stranger to marketing tactics — years of practice and experience render him an extremely credible and helpful marketing resource. The book, entitled YOUtility: Why Smart Marketing Is About Help Not Hype, discusses a new method to marketing that has taken rise and thus far proved to be long-term efficient and helpful to companies. Baer focuses on the idea that marketing is about helping the consumer, not just hyping up the company. Long-term loyalty in customers is, as you well know, gold for any business and YOUtility outlines the most important way your business can attract loyal, lifelong customers: by helping them. “How can I help?” is the question Baer says you should be asking yourself. It’s not only about selling products but also about genuinely helping potential and existing customers. 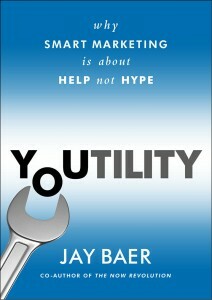 Throughout YOUtility, Baer pulls examples from businesses that use this strategy in their marketing. In his article on the YOUtility concept, he talks about Geek Squad, the 24-hour task force of specially trained agents dedicated to solving technological challenges. Geek Squad offers instructional videos on basic home technology fixes. Similar to Geek Squad’s technique, we discovered Lowes Hardware’s YouTube channel, which is dedicated solely to How To videos. The channel features seasonal videos on anything from “How to Keep Your Lawn Green” to “Gas vs. Charcoal” and an entire inventory of other helpful videos to get customers started on summer projects. In addition, Lowes takes questions via Twitter and makes video answers to the common questions. Lowes makes it clear that they are fully committed to their customers’ projects and needs—they are determined to offer help, not just hype. Finding ways to give customers useful information might feel like giving away all of your best secrets—Baer acknowledges that. But over time it pays off. A lifelong customer is always better than a one-time buyer. And with savvier consumers, it’s important that companies take the time to show that they care. Companies that care about their consumers will genuinely try to win their faith by occasionally not promoting or selling products. Rather than focusing on profits, teaching the consumer about the company’s tactics will help build a relationship with your customer that is based on loyalty and trust. Thanks for the kind words. I love what Lowe’s is going. Their VINE videos, called #FixinSix are terrific examples of Youtility.